I have a horror of shopping malls. It was not always this way. When I was young, I felt the thrill of the notes and coins in my pocket. I do not know when my Inner Bag Lady first stepped out to take the air. And I looked around, and away from the glassy glamour of the new, and clapped a hand to my forehead. She was right. But like most bag ladies she walks to the beat of her own drum. Most people are content to have their thoughts drowned out by the white noise of acquisition in the shopping mall. I have a lot of time for a Bag Man I learnt about once. Thoreau went to the woods in the 1840s to see what they could teach him, and they and he together have bequeathed us words we will never forget. He grew not only to love natural history but to hunger for tales from around the world of its natural wonders: he loved Charles Darwin’s Travels Of The Beagle’. 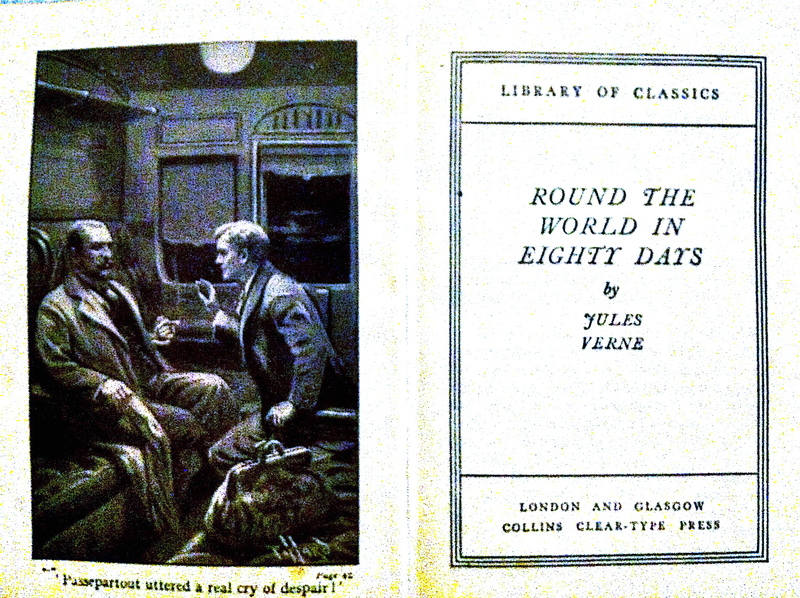 I wonder what he would have thought of the style of Phileas Fogg, the fiction adventurer coined by Jules Verne, writing in the same quarter century as Thoreau? Verne is a literary bag man: he drops every word he does not need, and carries only what is absolutely necessary to convey the precise colours and shades his narrative requires. Phileas Fogg is incredibly rich, but no-one knows how: he is spare, living in a comfortable house in Saville Row with just one servant; he likes his club, and routine, and we are led to believe he is a slave to the latter: right up until the moment he accepts a wager to go round the world in 80 days, flat. He has a new servant: Passepartout. It means ‘skeleton-key’. Those keys which can finesse and gain access to any lock. Passepartout, a Parisian with several trades – travelling singer, circus rider, tightrope walker- has just accepted a position as Fogg’s valet because it will mean a quiet life. For when has Fogg ever done anything but go to his club and come back again? Yet Fogg returns with the news that they must set out immediately. Their adventure is peerless. It changes them both forever.And a few, spare new clothes were needed. He does not eschew the new: but he specifies that life requires only what is really needed. More will weigh the adventurer down. I wonder how Thoreau would have viewed Fogg, had the flesh-and-blood met the fictional? I suspect Thoreau might have respected the man who wore Fogg’s clothes. Written in response to an ingenious theme by Side View: Enterprises That Require New Clothes, which you can find here. Posted in UncategorizedTagged Clothes, Henry David Thoreau, Jules Verne, Phileas Fogg, Round The World In 80 Days, shopping mallsBookmark the permalink. I’ve very much moved into the Bagman psyche since moving to France. Shopping in the country is not the pastime that it is in London.New clothes rarely happen and I’m a lot happier. The thought of going around the world in 80 days, or at all, is a nightmare to me. The more I hear of that French lifestyle of yours, the more interesting it sounds, Roger. To be permitted to be a Bag Person and ramble around seeking life: oh, yes; that would do splendidly. I love the quote from your favourite bagman. It sums up my unease about the Trinny and Susannahs of this world. There’s a book on my reading list called Overdressed: Responsible shopping in the age of cheap fashion. But because I’m cheap I’m waiting for it to come out in paperback. Hi Lynley! Hope life is treating you well 🙂 ‘Overdressed’ sound perfect for me. Charity shops (albeit the ones where Ladies Who Lunch ditch their labels) are my first port of call these days. A tour de Kate, as only Kate can do. Your Inner Bag Lady sounds like quite a character, Kate! What a delightful comparison of your favorite Bag Man and Verne. Both spare. Thoreau with clothes, Verne with words. I like that. I raise my hand as another who enters malls as a last resort, and when I must buy clothes, I head straight for the discounters and thrift shops. My husband affectionately calls me a ragamuffin, but clothes, makeup, hairdos, etc. seem superfluous to me. When a friend indicates on Facebook that she’s having a makeup party or going for a mani/pedi, I cringe and wonder why women feel it necessary or even desirable to paint their toenails. I firmly believe that it’s what’s on the inside that counts. (I do admit to a willingness to spend freely on camera gear, though). Terrific post. ‘Inner Bag Lady’ – bwhahahaha 😉 wonderful post again Kate! I don’t know about going around the world in 80 days – I would rather go to the centre of the earth (wouldn’t need any clothes in that heat). Thanks, Gabrielle! All that subterranean mullarchy would give me the heebie jeebies. Better the devil you know, I say…..
What a mind, Lou, and what a beautiful spirit that man was. Great post! I love Thoreau. He always seems to have something new to say to me, Katie. Those two years in the woods were obviously well spent. What a splendidly written piece! Thank you for making my day. Hello, Barbara, and thank you for coming along to read! You are most welcome. I thought my avoidance of the malls as I’ve grown older was an affliction. Maybe I should think of it as growing wisdom. Enjoyable post, Kate. I love Louisa Alcott’s quote. I’m lucky enough to live in the thick of their prowls. Walden is a few minutes drive, the Alcott’s houses scattered within an afternoon’s drive, Emerson and Hawthorne’s haunts not too far afield… The tour of Orchard House includes lots of anecdotes and quotes from Louisa, but that one I haven’t heard. I think Thoreau would have invited Fogg to the Alcott’s drawing room, for there were all the great discussions held. Louisa would have pressed him on women’s suffrage, May done a quick sketch of him, capturing the elusive spark in his eye that drove a man of steady habit to depart his life with nothing but a Parisian and a carpet bag.. Bronson and Henry devouring his description of the natural world thus far visited. What a fireside chat, that! …oh, to be a fly on the wall, Cameron…. It is a really entertaining read, Debra. the only reason I touched it is because it was one of the old books I found in the Winchester cathedral bookshop I was writing about. I’m so pleased I picked it up now. Only you, dear Kate, would take us around the world in this most delightful way. As you know, Thoreau and Alcott are favorites of mine. Now, I must get to know Fogg. Carry only what your soul can spare. My Inner Bag Lady. That’s a book title, Kate. For sure. I love the way you wove these people together. Alcott is also one of my favorites. Sadly, online shopping makes shopping so effortless. 🙂 I cannot stand to go to the mall, but point and click can be fun. It can be extremely convenient too! I have just shopped for Maddie’s home clothes day at her posh school, and without leaving my desk. I’m with you there, Andra. One of my favorites from Henry David Thoreau : I know of no more encouraging fact than the unquestionable ability of man to elevate his life by conscious endeavor. And to you too, Subhan. Glad you enjoyed the read. Thoreau is such a great thinker. I avoid malls like the plague. Their only purpose is to entice me to spend money I don’t have and expend energy I’ve very little of. Shopping online, however … that’s a whole ‘nother story. You and several other readers, PT, by the sound of it. It will certainly make Christmas shopping easier, that’s for certain! I detest shopping . . . and wasting time on trappings. And love Thoreau and Phileas. You hit a home run with this one, Kate! A pretty conjecture. I think one would have been Thoreau-ly startled, and the other be-Fogg-ed!